I'm running a query against CommonDataKinds.Phone.CONTENT_URI and I'm getting all the results that have a NOT NULL phone id. Shouldn't both be the same? 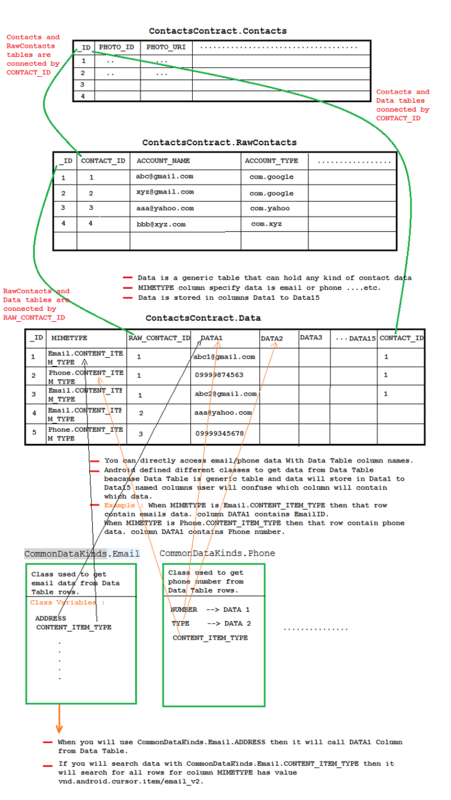 There are a lot of examples that use those exact columns to run queries. For example here and here if you check the Key pointers. ContactsContract.Contacts._ID returns unique ID for a row. Now the output will vary based on which cursor you are querying ContactsContract.Contacts._ID. If you query ContactsContract.Contacts._ID from ContactsContract.Contacts.CONTENT_URI , you will get ContactsContract.Contacts._ID and ContactsContract.CommonDataKinds.Phone.CONTACT_ID same. But if you query ContactsContract.Contacts._ID from ContactsContract.CommonDataKinds.Phone.CONTENT_URI you will get ContactsContract.Contacts._ID and ContactsContract.CommonDataKinds.Phone.CONTACT_ID different as on each phone entry ContactsContract.Contacts._ID is incremented. Not the answer you're looking for? Browse other questions tagged android android-contacts or ask your own question.